Rep. Mike Capuano struggles to understand why some voters think race and gender are relevant in this race. When Capuano campaigns, he doesn't talk much about his opponent, focusing on his own record. 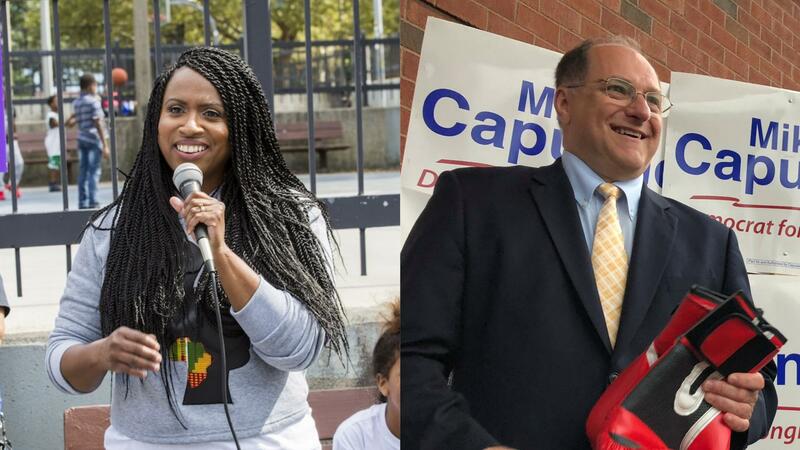 Ayanna Pressley, the first black woman elected to the Boston City Council in its 100-plus-year history, is taking on a 10-term white male incumbent, Rep. Michael Capuano, in Massachusetts' 7th Congressional District. 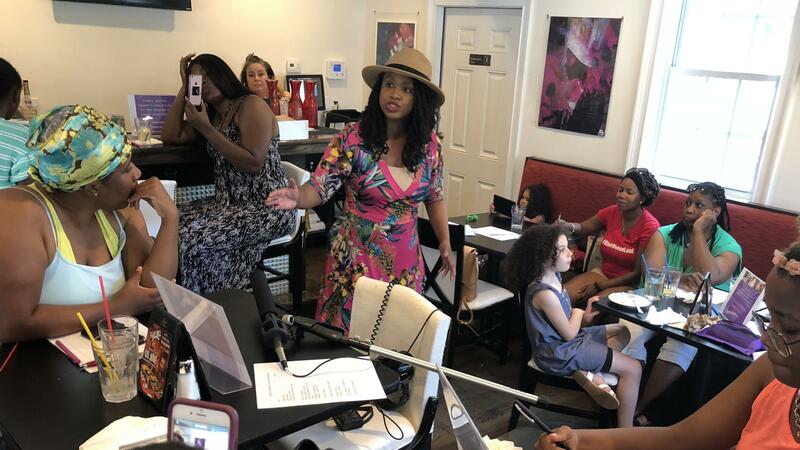 Ayanna Pressley talks to constituents on the campaign trail. Pressley is challenging a 10-term incumbent in the Massachusetts' 7th Congressional District Democratic primary. The night Alexandria Ocasio-Cortez won a Democratic congressional primary in New York, Ayanna Pressley, a Boston city council member who is also challenging a 10-term Democratic House incumbent, tweeted a congratulatory photo. And Ocasio-Cortez responded with an equally effusive tweet of her own. It's hard not to see similarities between Pressley's race in Massachusetts' 7th Congressional District and the recent Democratic upset in New York where Ocasio-Cortez defeated Rep. Joe Crowley, the No. 4 Democrat in the House who might have run to succeed Minority Leader Nancy Pelosi. Pressley, 44, the first black woman elected to the Boston City Council in its 100-plus-year history, is taking on a 10-term white male incumbent, Rep. Michael Capuano, 66, who represents an urban district that encompasses Boston, Cambridge and surrounding suburbs, much of the area once represented by a young John F. Kennedy, and now often called the "Kennedy seat." But beyond the initial optics, the 7th District primary, which will be held on Sept. 4, is fundamentally different from that in the Bronx and Queens district where Ocasio-Cortez won. Pressley is not an outsider nor does she identify as a Democratic Socialist as Ocasio-Cortez does. She has worked within Democratic Party institutions for most of her career, as a congressional aide for 16 years, first to Rep. Joe P. Kennedy II and then to Sen. John Kerry. Capuano doesn't have the same vulnerabilities as Crowley did in New York. He has taken Pressley as a serious challenger from the outset. He specifically courted endorsements from civil rights icon Rep. John Lewis, D-Ga., the Congressional Black Caucus PAC and former Massachusetts Gov. Deval Patrick. Capuano is also a known progressive. He supports Medicare-for-all, voted against the Iraq War, refused to attend President Trump's inauguration and has even supported an impeachment vote on the president. The reality is both Pressley and Capuano have similar progressive policies. She calls for abolishing U.S. Immigration and Customs Enforcement. He voted against the Homeland Security Act that originally established ICE. "There's no daylight between the public policy positions of both candidates," said Scott Ferson, a Democratic strategist, who helped Rep. Seth Moulton, D-Mass., successfully challenge a Democratic incumbent congressman in 2014. Pressley concedes there is no difference in how they would vote on Capitol Hill, but she also insists that is not why she is running. "This was the seat held by John F. Kennedy, so having a progressive voting record is baseline," she said before referring to Kennedy's famous book. "That is not necessarily a profile in courage." Pressley says even if they vote identically on existing bills, they'll likely write and champion distinctive legislation. She points to the Mothers and Offspring Mortality and Morbidity Awareness Act, a bill to improve federal efforts to fight maternal mortality, an issue that disproportionately affects African-American mothers. "As of yet, no one from our delegation has signed on the MOMMA Act as a co-sponsor," Pressley said. "Now there are 12,000 bills, it's impossible to keep up, I don't think this means they don't care about it. But if I'm there, this is an issue I'm focused on." She also points to her record as a Boston council member on gun violence, structural racism and the wage gap. Capuano points to his experience, seniority on committees and record of delivering both results and money for infrastructure projects around Boston. With no major policy arguments, the fight boils down to representation, worldview and how much race, gender and age ought to matter in Democratic Party politics. And although a majority of residents in the Boston-area district are not white, an analysis by NPR member station WBUR found that a majority of voters are white. Pressley's campaign slogan is "change can't wait." She is tired of some people suggesting it's "traitorous" to challenge a fellow Democrat. She points out that the 7th District is the most diverse district in the state, but also has very high income inequality. And that's the message she delivers on campaign stops. "Listen, I'm not saying vote for me because I'm a black woman, but I won't pretend representation doesn't matter. It matters," she told a couple dozen women and girls of color at a Dominican restaurant in Boston. "This district is 57 percent people of color and almost 40 percent single-female-headed households. The district has changed," she said. "The needs of this district have changed, and the job description has changed." But Capuano, who has held this job for 20 years and never faced a serious challenge until now, takes issue with that line of criticism. "All districts change," he said. "This district, greater Boston, is a very transient neighborhood. It's always changing." Plus, he insists, the district does not have a simple majority demographic. "There's no majority of any race, any creed, any ethnicity, anybody," he said. "And anybody who wants to govern this district, really has to reach out to people that don't look like them ... and don't think like them." Capuano struggles to understand why some voters think race and gender are relevant in this race. "I've always been put off by identity politics on every level," he told The Boston Globe in May. When asked about representation, he tends to pivot the conversation back to his record on housing or transportation. "Look, I cannot be a woman of color," he told WBUR in February. "I just don't think there's that many people who will vote for me because I'm a white male, or against me because I'm a white male." When Capuano campaigns, he doesn't talk much about his opponent; he tries to focus on his own record. But he has said that "it's unfortunate" Democrats are spending time and money on a "family fight" when their real foe is President Trump. "I hear people who want me to fight against Donald Trump. 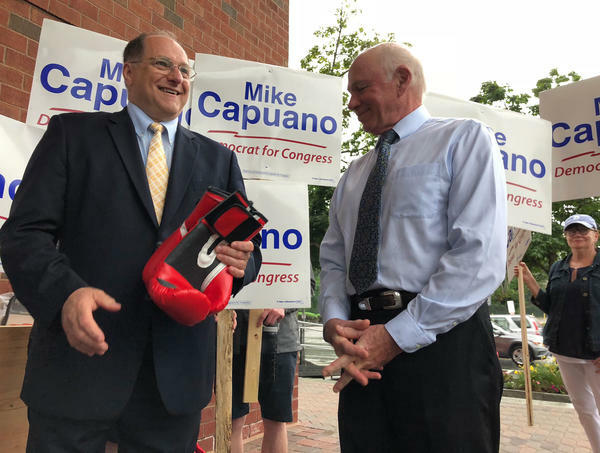 I hear people who talk to me about issues, and the issues I hear mostly, first of all, are Donald Trump on pretty much everything," Capuano said at a recent campaign stop in a Boston suburb. At another stop in a senior center in his hometown of Somerville, Capuano never once mentioned his rival. Instead, he spoke about Medicare, the Affordable Care Act and Republicans. "There's a lot of way to kill something, one way is to bankrupt it, so even if they don't repeal it, say 'we're gonna get rid of Obamacare, we're gonna get rid of Medicare,' they can still bankrupt it," he told a group of a seniors. There is no doubt that Capuano has the money and the loyalty of a popular incumbent. "You have to have a reason to turn Mike Capuano out of office, and I don't see that," said Ferson. But all signs in the midterm elections suggest this is the year of the woman, specifically the Democratic woman. 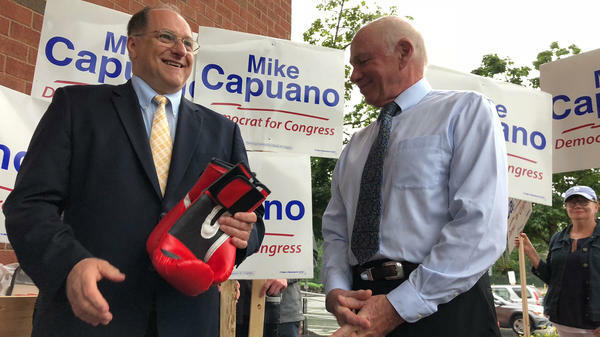 Doug Rubin, a Democratic consultant in Boston, says it's plausible voters might think Capuano has done a good job as a congressman and yet still want a change. "There is a real kind of organization around women voters who want to send a message to Trump," he said. "And Ayanna is in a perfect position to take advantage of that." Regardless of who wins, Rubin says a family fight every so often is healthy. It motivates people to get to the polls and that may be just what Democrats need, he says, not just here in Massachusetts, but all over the country.